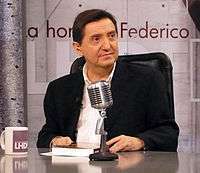 Federico Jiménez Losantos is a popular Spanish pundit, being most known for his radio talk show, but also a TV host and literary author. He was born in Orihuela del Tremedal, Teruel, on September 15, 1951. Raised in a humble family, Federico started succeding in school from early age.He earned a degree in Spanish Studies (section Philology) at the University of Barcelona after spending almost his entire academic formation under scholarship of excellency, becoming a teacher of Spanish Literature at the Instituto Lope de Vega, a high school in Madrid. During the early 1970s, Jiménez Losantos was an active anti-Francoist member in different illegal maoist and communist organizations based in Barcelona, where he got his degrees and lived before and during the Spanish transition to democracy. He grew disillusioned with the communist creed as a result of a journey to Maoist China, where he had gone to receive military and ideological training, but, having realized instead of the real situation of the populace and the thorough control it was subjected to, this journey triggered a complete reversal of his political stances. Nowadays he defines himself as classic liberal, while opponents accuse him of being close to the European hard right. In all, often his views can be close to those of right libertarianism. He is particularly positioned against the Spanish Socialist Workers' Party, which he argues is understanding with terrorists in Spain and abroad, on the one side and Catalan and Basque nationalism (and what he sees as their alleged historical revisionism) on the other side. His views are unusual within Spanish journalism, as he supported the 2003 invasion of Iraq and believes Global warming is not caused by human activity. He has been highly critical of Juan Carlos I of Spain, arguing that he should have opposed the PSOE government over its policies in the Basque country and Catalonia and should have abdicated earlier than he did. In 1981 he was abducted at gun point by the now-defunct Catalan independentist terrorist organization Terra Lliure, taken to a remote location and shot in the leg. He was left bleeding and tied to a tree. A female companion, that was also abducted and left tied but otherwise unharmed, managed to free herself and get help. This was in reprisal for having signed a manifesto demanding an end to the Catalan regional government's then new language policies which implemented the preponderance of the use of Catalan over Spanish. The aforementioned policies were initially meant for official governmental usage and intended to reverse the Language politics in Spain under Franco. They were implemented following the correspondent law as approved by the Catalan Parliament. Following the attack, he moved to Madrid, where he was hired as Op-Ed Editor of the conservative Diario 16 newspaper. He then worked for Antena 3 Radio, and later for the COPE radio network of the Spanish Catholic church. After a year in Miami, he returned to Spain and took charge of La Linterna, a night program on COPE radio. In 2003 he became director of La Mañana, also on COPE, and became increasingly popular in the morning radio. With La Mañana he became one of the most listened-to radio talk show hosts in Spain until he parted ways in July 2009. He is founder and editor of the Spanish and self-styled libertarian on-line newspaper Libertad Digital. He is also a regular columnist for El Mundo and has written several books, mostly on political topics. He also debuted in poetry with a book of haikus. In 2005 he started 'The Spain Herald', an English-language digest of articles from Libertad Digital which has been off-line since June 2006. He has been successfully prosecuted on a number of occasions for defamatory pronouncements. This includes being legally prompted, along with his employers COPE, to pay compensation of 60,000 euros to the Esquerra Republicana de Catalunya political party, which donated that money to non-profit organisations. In 2009, after the discomfort that Losantos's outspoken and uncompromising editorial line was creating in the COPE (deeply critical of the former Spanish premier Zapatero, but, somewhat surprisingly for Spain's partisan politics, equally critical of the conservative opposition, which he chastises as being bland and lacking a real alternative project), he did not accept the new role he was offered by this radio station and announced he was moving, among others, to create his own radio station, esRadio, to be launched in September of that same year. ↑ In another case, he was found guilty of verbal offence against the mayor of Madrid, Alberto Ruiz Gallardon, and also received a fine, for having called him a traitor towards terror victims of 11-M. His answer was that "Gallardon's honour was cheap after all".